The Rice Krispies fans are cross - very cross! Without warning, Kellogg’s totally changed the recipe for those Krispies - and the Coco and Strawberry Pops, too - and consumers are so not loving the so-called new, improved versions. For now, Kellogg’s is just smiling and waving in response… So what was the cereal maker thinking? There’s an all-new Rice Krispies product on supermarket shelves, and according to many, it’s far from nice. Listen to the podcast below, or read the details under that. As anyone who spends any time on social media will know, there’s not much that unites South Africans across racial, gender, and culture lines, but there appears to be one issue Mzansi does agree on, and it’s that Kellogg’s really, really shouldn’t have messed with its Rice Krispies recipe. The cereal may have retained its iconic name, but its formula has shifted from Rice Krispies to multigrain Krispies - it still contains some rice flour, but now also corn and wheat flour. And most notably, the sugar content has gone from 9% to 21,7% - so even the children are complaining that it’s too sweet. A vanilla flavour has been added, and apparently the Snap, Crackle, Pop has gone. Thus at a time when there’s a huge shift to lowering sugar content of processed food and drinks, as evidenced by South Africa’s recently introduced sugar tax on sugary beverages, this is rather strange. I asked Kellogg’s about the sugar issue, and the response I got from the company’s director of research, nutrition, and technology, Xolile Mbatha, was that the new vanilla Rice Krispies did have “a thin coating of sugar” to enhance crispiness - equivalent to 1.5 teaspoons per serving. “But we acknowledge that there is more room for improvement by way of both consumer education as well as our ongoing commitments to make our products better and to meet consumers’ needs,” she said. “I bought two boxes and my son HAAAAATES them!” said Gugulethu Zungu. I haven’t seen South African consumers this cross about a product change since Unilever messed with its Sunlight dishwashing liquid bottle - turning it upside down and putting a funny nozzle on it. Apparently Kellogg’s did consumer research before making the radical change. A tasting test group included “both existing Rice Krispies consumers and those who had lapsed or had never consumed it - all of them mothers and their children,” Mbatha said. “While we understand there are differences in everyone’s taste, the results from this market research indicated that the Rice Krispies Vanilla concept and food was significantly liked by all consumers,” she said. The move from a single grain (rice) formula to multi-grains allowed Kellogg’s to source all their major ingredients locally, she said, “whereas previously we imported all main ingredients”. 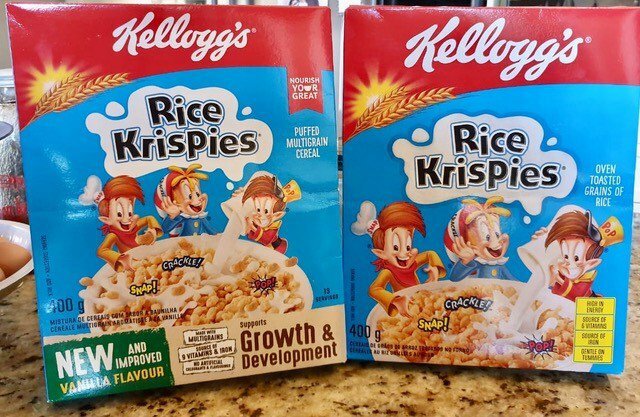 To those who are pleading for the return of the old Rice Krispies, Kellogg’s says: “Unfortunately at this stage we have phased out the plane (sic) Rice Krispies. Over the years we have received numerous indications that our customers in SA want innovative, tasty new recipes and products and thus New Rice Krispies was introduced." In her response to me, Mbatha said that in order to improve consumer awareness of this new Rice Krispies Vanilla, the company would be “conducting sampling in stores and expanding the sample base over the coming months." Companies seldom admit they got it wrong with a change, and revert to the original product, but it’s not unheard of - Unilever dropped its upside down bottle fairly quickly in the face of a furious consumer backlash, and that was before the days of social media. And incidentally, that company also insisted that its consumer research had revealed great acceptance of the new bottle. Maybe the problem lies with the quality of market research.